The SGP30 gas sensor combines multiple metal-oxide sensing elements – the pixels – on one chip, thereby offering the possibil-ity of measuring a total VOC signal (tVOC) and a CO2 equivalent signal (CO2eq) with one single sensor chip. The SVM30 also offers calibrated air quality output signals as well as compensation of humidity cross-sensitivity. The gas sensing element fea-tures unmatched robustness against contamination by siloxanes present in real-world applications, enabling unique long-term stability and low drift. Furthermore, the integrated SHTC1 humidity and temperature sensor covers a humidity measurement range of 0 to 100% relative humidity (RH) and a temperature measurement range of -20 to 85°C with a typical accuracy of ±5% RH and ±1°C. The gas, humidity and temperature sensor components are designed with Sensirion’s proven CMOSens® Technology. This technology offers a complete sensor system on a single chip, including the sensing elements, analog and digital signal processing, A/D converter, calibration and data memory as well as a digital communication interface supporting the I2C standard mode. Sensirion’s state-of-the-art production process, including full calibration and testing of the sensors, guaran-tees high reproducibility and reliability. 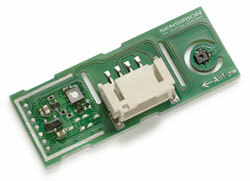 Sensirion AG, headquartered in Staefa, Switzerland, is the world's leading manufacturer of digital microsensors and systems. The product range includes gas and liquid flow sensors, differential pressure, as well as environmental sensors for the measurement of humidity and temperature, volatile organic compounds (VOC), carbon dioxide (CO2) and particulate matter (PM2.5). An international network with sales offices in the USA, Europe, China, Taiwan, Japan and Korea supplies international OEM customers with standard and custom sensor system solutions for a vast range of applications. Sensirion sensors can be commonly found in medical, industrial, automotive, analytical instruments, consumer goods and HVAC products. One of the hallmark features of Sensirion products is the use of patented CMOSens® Technology which permits intelligent system integration of sensor element, logic, calibration data and a digital interface on a single chip. Sensirion's credentials as a reliable OEM supplier are underscored by its loyal customers, quality reputation (ISO/TS 16949) and top customer pedigree.